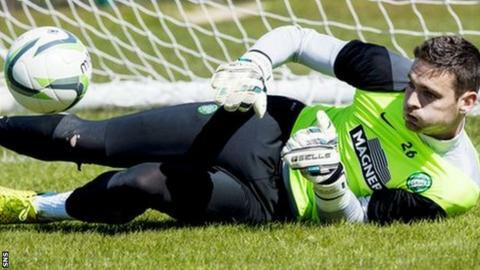 As Craig Gordon emerged from a Baku school where Celtic representatives were presenting footballs and shirts to pupils, the mercury touched 40c. This oil-rich, sprawling Azerbaijani capital greeted the club's players at midnight local time the day before with temperatures just 10 below that of mid-afternoon. Not that the big Parkhead goalkeeper appeared perturbed, though the searing heat did evoke memories in the towering stopper of one of his unhappier moments in the game. And Gordon is determined that - unlike in Skopje with Scotland - he and his Celtic team-mates will not make the same psychological mistakes he felt were made that day by George Burley's side. "It's pretty warm," Gordon said as he sat down for a few moments to look ahead to Wednesday evening's Champions League qualifying return against Qarabag. "Hopefully it'll calm down a little bit for when we are training and playing. We'll have to come up with a game plan that brings the heat into account and try and win the game regardless. "Macedonia was pretty hot but even then, I think in the second half, the players realised it maybe wasn't quite as bad as we had prepared for. "We may have over-thought the situation and took it into account too much, so it's something we'll need to be wary of, but not something we can concentrate on or use as an excuse." Indeed, while the overhead conditions will undoubtedly suit Qarabag more than Celtic, Gordon was keen to point out that the underfoot conditions could prove detrimental to their opponents. And going by what was witnessed at Celtic Park a week ago, the scorched surface at the Tofiq Bahramov Stadium, will not chime with the hosts' desire for slick football. "The pitch will be the same for both teams," Gordon added. "I think Qarabag are a very good passing team and they showed that at Celtic Park, kept possession very well, so it'll affect them as well. "We'll perhaps have to come up with something that takes the pitch into consideration as well and maybe have to watch the back-passes. "We might have to play a bit longer but once we've trained on it we'll have a better idea of what to expect. "But, it's just football, it's what happens when you go to different countries to try to qualify for big competitions. We just have to deal with it." Baku is an impressive city - even Donald Trump built one of his towers here - and Qarabag will be backed by an impressive 31,000-strong crowd, with the locals confident that it is a matter of how big the win will be rather than if they can overturn the 1-0 deficit. "It's a difficult one but it's the same as every season, Celtic want to be in the Champions League every year," he said. "That's probably unrealistic but it's something that we strive for every year and more often than not in the last few seasons we've managed to do that. "We have a very difficult game and if we get through that we'll have another two to play. "It's exciting and it's part of being at Celtic." Before Gordon boarded the bus to put his feet up for a couple of hours ahead of their crucial burnt-pitch training session on Tuesday evening, it would have been remiss not to get his take on Saturday's incident with Jackson Irvine. Some felt the yellow card handed to him against Ross County in their league opener was too lenient. Unsurprisingly perhaps, Gordon believes Willie Collum's decision was correct. "One hundred percent," he said. "The referee got that one spot on, it was far too wide to give a red. "I think every time it's been stopped on TV, it's been stopped at the moment of impact. If you run it on, it's at least three strides he'd have to take to catch the ball. "And if Virgil (Van Dijk) takes three more strides he'd be on the penalty spot, so it's definitely the correct decision." Not exactly the season's most surprising answer. And with that, a confident Gordon set his sights back on Qarabag and a possible big step towards the biggest club tournament there is.